شادی و نشاط آئين ريشه ايست با حضور خود در اين جشن، فرهنگ ايرانی را زنده نگهداريد و آن را به نسل های آينده واگذار کنيم. 529 BC - The international day of Cyrus the Great, king of Persia, who declared the first charter of human rights in the world also known as Cyrus Cylinder. 1268 - Conradin, the last legitimate male heir of the Hohenstaufen dynasty of Kings of Germany and Holy Roman Emperors, is executed along with his companion Frederick I, Margrave of Baden by Charles I of Sicily, a political rival and ally to the hostile Roman Catholic church. 1390 - First trial for witchcraft in Paris. 1618 - English adventurer, writer, and courtier Sir Walter Raleigh is beheaded for allegedly conspiring against James I of England. 1665 - Battle of Ambuila, where Portuguese forces defeated the forces of the Kingdom of Kongo and decapitated king Antonio I of Kongo, also called Nvita a Nkanga..
1675 - Leibniz makes the first use of the long s, ∫, for integral. 1709 - England/Netherlands sign anti-French "Barrieretraktaat"
1792 - Mount Hood (Oregon) is named after the British naval officer Alexander Arthur Hood by Lt. William E. Broughton who spotted the mountain near the mouth of the Willamette River. 1859 - Spain declares war on Morocco. 1881 - Judge (U.S. magazine) first published. 1901 - In Amherst, Massachusetts nurse Jane Toppan is arrested for murdering the Davis family of Boston with an overdose of morphine. 1913 - Floods in El Salvador kill thousands. 1921 - The Link River Dam, a part of the Klamath Reclamation Project, is completed. 1929 - "Black Tuesday," Stock Market crashes triggers "Great Depression"
1945 - Getulio Vargas, president of Brazil, resigns. 1967 - London criminal Jack McVitie is murdered by the Kray twins, leading to their eventual imprisonment and downfall. 1969 - Supreme Court orders end to all school desegregation "at once"
1982 - Paul McCartney & Michael Jackson release "Girl is Mine"
1985 - Major General Samuel K. Doe is announced the winner of the first multiparty election in Liberia. 1998 - Apartheid: In South Africa, the Truth and Reconciliation Commission presents its report, which condemns both sides for committing atrocities. 1998 - While en route from Adana to Ankara, a Turkish Airlines flight with a crew of 6 and 33 passengers is hijacked by a Kurdish militant who orders the pilot to fly to Switzerland. The plane instead lands in Ankara after the pilot tricked the hijacker into thinking that he was landing in the Bulgarian capital of Sofia to refuel. 1998 - Hurricane Mitch, the second deadliest Atlantic hurricane in history, made landfall in Honduras. 1998 - Space Shuttle Discovery blasts off on STS-95 with 77-year old John Glenn on board, making him the oldest person to go into space. 1998 - ATSC HDTV broadcasting in the United States is inaugurated with the launch of STS-95 space shuttle mission. 1999 - Deadliest Indian Ocean tropical cyclone hits Orissa, India. This event was known as 1999 Orissa cyclone ever since. 2002 - Ho Chi Minh City ITC Inferno, a fire destroys a luxurious department store with 1500 people shopping. Over 60 people died and over 100 are missing. It is the deadliest disaster in Vietnam during peacetime. 2004 - In Rome, European heads of state sign the Treaty and Final Act establishing the first European Constitution. 2004 - The Arabic news network Al Jazeera broadcasts an excerpt from a video of Osama bin Laden in which the terrorist leader first admits direct responsibility for the September 11, 2001 attacks and references the 2004 U.S. presidential election. 2005 - 29 October 2005 Delhi bombings kill more than 60. 2007 - Argentina elects its first female president, Cristina Fernandez de Kirchner. 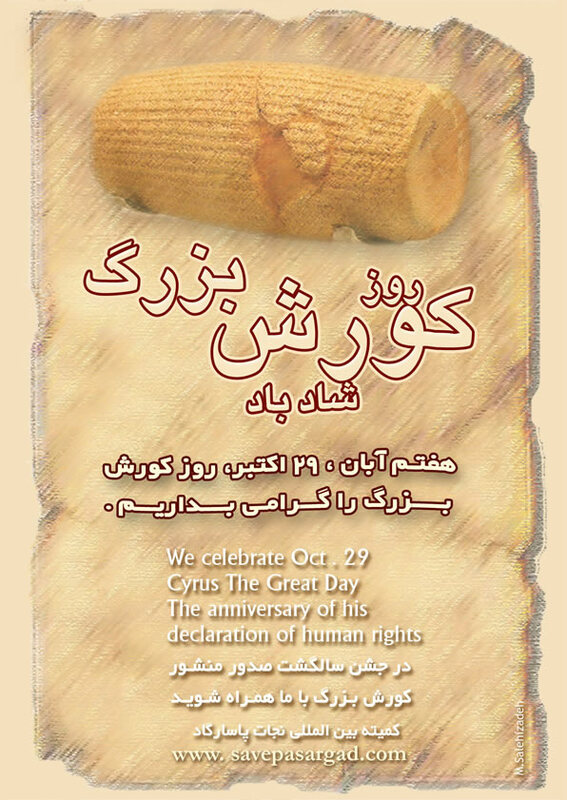 October 29th has been designated as the international day of Cyrus the Great, king of Persia, who declared the first charter of human rights in the world, also known as the Cyrus Cylinder. In 539 BC, Persian troops entered the city of Babylon, without encountering any resistance. On October 29th, Cyrus himself entered the city, assuming the titles of "King of Babylon, King of Sumer and Akkad, King of the four corners of the world.� The Cyrus Cylinder was placed under the walls of Babylon as a foundation deposit, following a long Babylonian tradition. 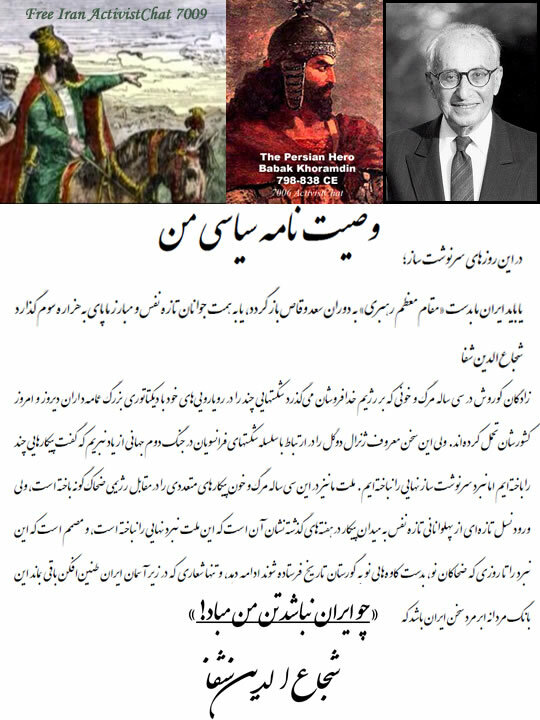 you hear in this video last shah-n-shah of iran Aryamehr speaking beyond the tomb of cyrus the great during the 2500 years celebrities of iranian monarchy of iran. The english translation you hear orson wells. 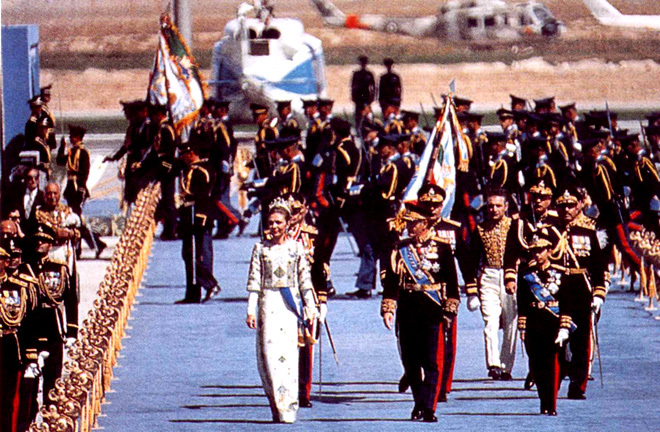 : From the days of the rule of the Shah, when Iranians were proud, respected and honored in the world�. Once again October 29th is rolling around. And once again, free people all over the world celebrate the memory of Cyrus the Great, the author of mankind�s arguably greatest document, the first Charter of Human Rights. This benevolent king, ruling over a vast empire of diverse people, enshrined in the Cyrus Cylinder, nearly three millennia ago, the principles that define and protect human dignity. It has been well over four years since the International Committee to Save the Archeological Sites of Pasargad initiated a massive celebration for the International Day of Cyrus the Great all over the world. For the past four years, especially, the courageous Iranian people have gathered by the tomb of Cyrus the Great, to commemorate this momentous international event, despite numerous intimidations and harassments by the agents of the Islamic Republic. Cyrus the Great�s recognition of human rights, irrespective of any and all considerations, was instrumental in advancing the social and cultural precepts of the diverse people throughout the vast expanse of his empire. Although ethnically Persian, the benevolent king considered himself a trustee of the diverse nationalities of his kingdom. Parochialism and ethnocentrism were alien to this visionary monarch. In the same way that Cyrus the Great considered all people members of the same human family, the human family of today holds the great trailblazer of human rights as one of its own. The vast plateau that is the presently encompasses Iran has been inhabited by the most diverse people of any region of the planet. Yet, in adherence to the lofty principles of Cyrus, these people found unity in diversity. They remained loyal to their own unique heritage and successfully linked it to a larger loyalty. The present Iran is a living testimony to this remarkable togetherness where ethnic Persians, Turkic, Kurds, Lurs, Turkmen, Baluchis, Arabs, and others live as one people. Cyrus� Charter of Human Rights is the first written document which stipulates that all humans have universal inalienable rights, without regard to any and all demographic considerations such as ethnicity, nationality and religion. The great king practiced what he believed. He, for example, helped rebuild the temple of Solomon which had been destroyed by the Babylonian kings and freed some 40,000 or more Jews who had been imprisoned and kept as slaves by the Babylonians, empowering the Jewish people to return to their homeland. While free people of the world recognize and honor this outstanding historical figure, the Islamist usurpers presently ruling Cyrus�s homeland have been busily doing their best to erase any and all traces of his luminous heritage. For one, under the guise of rural development, the Islamic Republic of Iran is flooding the plain that houses Cyrus�s stone tomb. 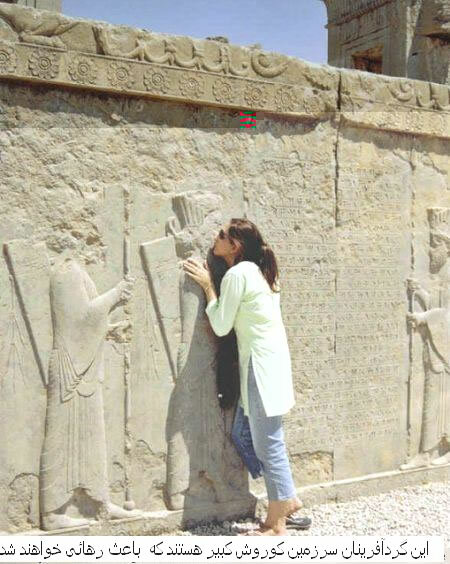 The IRI is contemptuous of anything it deems non-Islamic and has embarked on destroying the archeological sites of Pasargad and Persepolis and the Tomb of Cyrus the Great. -- examples of humanity's most prized cultural heritage. The Mullahs� actions are part of a systematic campaign of destroying the universal inclusive Persian vision and promoting the barbaric exclusionary Islamist myopia. To these turbaned criminals and their functionaries, any non-Islamic, including people such as Jews, Baha�is, or unbelievers of any kind have no right to exist at all. It is in this vicious intolerant spirit that the IRI�s president Mahmoud Ahmadinejad has placed the destruction of Israel at the top of his agenda. And it is with the aim of imposing a most virulent brand of Islam that Ahmadinejad, the point-man of a most radical gang of Shi�a clerics, is doing all he can to acquire nuclear weapons capability. It is tragic indeed that after 2500 years since the declaration of the first Charter of Human Rights, at the dawn of the new millennium, Iranians are struggling for basic human rights under the oppressive yoke of the Islamists. Further indignity is inflicted on the people of Iran by the news that the Cyrus Cylinder in the British Museum is to be lent to the Islamic Republic. This priceless document belongs to Iran. Entrusting it to the hands of the sworn enemies of Iranian heritage entails an unacceptably high risk. It is imperative that the British authorities rescind the decision and take every measure to insure that the Cyrus Cylinder is preserved safely and returned to Iran only after the demise of the Islamic Republic. It is not a case of unwarranted alarmism when a vast number of Iranians are deeply concerned about the fate of the Cyrus Cylinder, should it entrusted to the untrustworthy hands of the Islamists. The Islamic Republic of Iran is staffed by diehard elements who love nothing more than out-doing the heinous act of Afghanistan�s Taliban who destroyed the irreplaceable two Buddha statues. What is enshrined in the Cyrus Cylinder is unconditional respect for the complete rights of all the people of the world, an anathema to the Islamists� credo. It is with great apprehension that the Iranian people warn Mr. Andrew Murray Burnham, the British Secretary of State for culture, as well as the British government regarding the plan to lend this precious treasure of humanity to a contemptuous cult of medieval mullahs. Furthermore, it is urgent that UNESCO immediately registers Cyrus the Great�s Charter of Human Rights Cylinder in its World Heritage Memory, in order to safeguard the diverse cultural heritage of the peoples of the world. The story of the brave Iranian national hero, Babak Khorram-Din, who in the 9th century led the rebellion against the foreign invasion of Iran. After 23 years of courageous resistance he was captured and brutally executed. It was time to bridge the gap by turning back the clock. "The idea of holding a ceremony which would highlight Iran's glorious past in the world was nothing new," Mr Ansari said calmly waking me from my reverie. 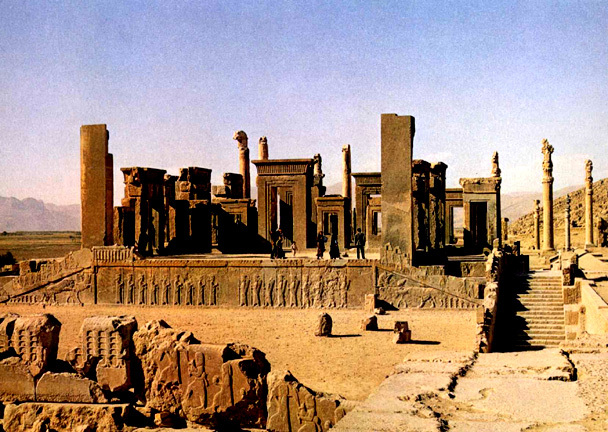 In 1960, Shojaeddin Shafa, an Iranian scholar had sent a proposal to the Shah of Iran suggesting that he hold a colourful pageant thirty miles outside Shiraz in the ruins of Takht-e Jamshid, or Persepolis, the "City of Persians", built by King Darius and burned to the ground by Alexander the Great in 331 B.C. 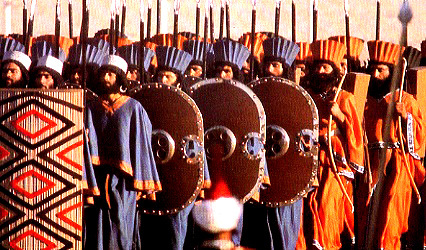 The Shah had given his tacit approval and a small committee headed by Amir Homayoun, a venerable senator, had been formed to consider a festival to mark the 2,500th anniversary of the original Persian empire founded by Cyrus the Great in the 6th century B.C. This site is dedicated to all Iranians. Exclusive Site of Dr. Shojaedin Shafa. In this third excerpt from Dr. David Neiman's lecture series, The Church and The Jews, Dr. Neiman discusses the Jewish community living under Persian Emperor Cyrus The Great. And the rebuilding of the Temple in Jerusalem. In this fourth excerpt from Dr. David Neiman's lecture series, The Church and The Jews, Dr. Neiman delves into the vast empire controlled by Persia, and the Jewish diaspora community that thrived in that region for centuries. 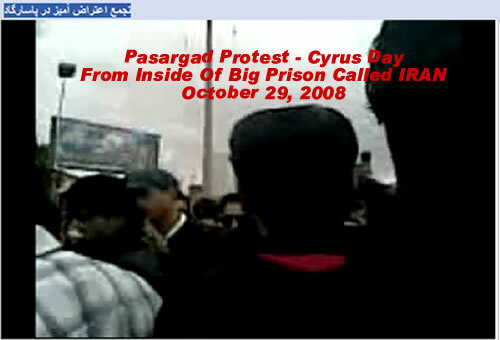 Posted: Tue Nov 04, 2008 7:10 am Post subject: Must Watch Video From Big Prison Called "Iran"
رژیم جمهوری اسلامی بار دیگه دشمنی خودش رو ا فرهنگ و تمدن ایرانی نشان داد. گزارشی از بزرگداشت کوروش بزرگ در پاسارگاد..کوروش ببین که در وطن خویش غریب افتاده ایم...! نقض حقوق بشردر روز جهانی نوشته شدن فرمان حقوق بشر، کنار آرامگاه بنیانگزار حقوق بشر...! گزارشی از بزرگداشت کوروش بزرگ در پاسارگاد...کوروش ببین که در وطن خویش غریب افتاده ایم...! از چندی پیش بنا بود با دیگر دوستان میهن پرست خوزستانی در روز 29 اکتبر (هفتم آبان ماه) 1387 برابر با روز جهانی کوروش بزرگ در کنار آرامگاه شاهنشاه دادگستر گرد هم آییم.2547 سال پیش (539 پیش از میلاد) در چنین روزی فرمان حقوق بشر کوروش بزرگ به گوش مردم ستمدیده بابل و جهانیان رسید.چیزی که تا آنروز در آن دنیای وحشی روی نداده بود. رفتن به پاسارگاد و یادکرد آن بزرگ مرد وظیفه هر ایرانی و غیر ایرانی است که به انسانیت و عدل و داد معتقد است. از همان ابتدای ورود به شیراز فهمیدیم که اداره اطلاعات با برگزاری مراسم بزرگداشت کوروش از سوی انجمن فرزندان آریایی به شدت مخالف است و اجازه این کار را نمیدهد همچنین به آقای ببراز بازوبندی گفته شده است که افراد بختیاری نباید با پوشش محلی بختیاری(چوقا- شلوار دِبیت و کلاه) در آنجا ظاهر شوند،! با این پیش درآمد ، بامدادهفتم آبان به تخت جمشید رفتیم تا از این بنای بزرگ یادگار شکوه ایران دیدن کنیم . پس از بازدیدغروب همان روز به پاسارگاد رسیدیم .تعداد کم افراد حاظر در انجا که از روزهای عادی هم کمتر بود جلب توجه می کرد! جو به شدت امنیتی بود و از رفتن ما به درون محوطه از سوی ماموران حراست جلوگیری به عمل آمد و به ما گفته شد که بختیاری ها باید پوشش خود را عوض کنند این مورد باعث دلگیری شدید " بهرام آبتین مسئول انجمن لربختیاری" شد. در همان چند دقیقه ای که روبروی درب ورودی پاسارگاد به انتظار پاسخ و همکاری ماموران بودیم مرتب از ما عکس بردای میشد. ماموران حاظر درآنجا به این بهانه که به ما دستور داده شده است از ورود ما به محوطه جلوگیری کردند و گفتند بختیاری ها برای نشان دادن خود و عرض اندام ، اغتشاش آمده اند و نباید با پوشش محلی بختیاری وارد محوطه شوند! وهمچنین اجازه نواختن ساز و دهل را ندارند که با این رفتار ناشایست، دوستان بختیاری ما از همانجا با نارضایتی و ناراحتی به اهواز و چهارمحال بختیاری برگشتند، اما گروه 20 نفره ما تصمیم گرفتیم تا فردا صبح صبر کنیم شاد بتوانیم از آرامگاه دیدن کنیم. پس از گفتگو با یکی از روستاییان برای اقامت شب در آنجا باز هم از سوی ماموران به ما گفته شد که صلاح نیست شب را در روستای پاسارگاد باشیم و ممکن است برای ما مشکل ایجاد شود! به هر ترتیب شب را در 15 کیلومتری پاسارگاد در سعادت شهر گذراندیم و فردا صبح هشتم آبان ساعت 9 جلوی درب ورودی محوطه باستانی پاسارگاد بودیم. تعداد ماموران لباس شخصی و نیروی انتظامی از روز پیش کمتر بود ؛ برای ورود از همه ما کارت شناسایی خواسته شد و نشانی دقیق و حتی شماره تلفن و موبایل ها ما هم یادداشت شد. پس از طی این مراحل به درون محوطه هدایت شدیم و از همانجا 2 سرباز نیروی انتظامی و یک مامور حراست و یک فرد لباس شخصی به همراه ما تا کنار آرامگا آمدند.نمی دانم قرار بود ما 20 نفر در آنجا چه کنیم که اینگونه هراسان شده بودند. 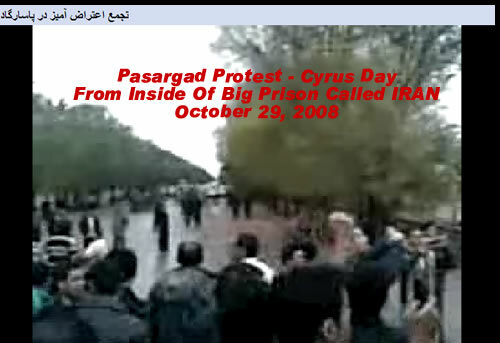 پس از ادای احترام به پدر ملت ایران کوروش بزرگ تصمیم به خواندن سرود ای ایران داشتیم که از سوی ماموران به ما گوشزد شد حق خواندن هیچ گونه سرود وترانه و بیانیه ای را نداریم! پس یکی از بانوان همراه ما از دوستان خواست که گرد هم آییم تا به تنهایی و با صدای آرام قطعه شعری را که برای کوروش بزرگ سروده است بخواند که باز هم از سوی سربازان و مامور حراست از این کار جلوگیری به عمل آمد اما ایشان شروع به خواندن شعر کرد تا به بخشی رسید که در آن اشاره می شد " پرچم شیرو خورشیی بی یال و دُم رها شد" مامور امنیتی که با لباس شخصی و جلیقه در کنار ما ایستاده بود با صدای بلند شروع به فریاد زدن نمود که پرچم شیرو خورشید سی سال پیش آتش گرفت، شیرو خورشید مرد و این جملات را با صدای بلند چند بار تکرار کرد و با کلمات توهین امیز به حاضرین فحاشی نمود که من (میلاددهقان) و خانم آریانا وآقای امیر بختیار واکنش نشان دادیم و به ایشان گوشزد کردیم که این حق ماست که بسیار آرام بتوانیم در اینجا شعری بخوانیم و شما حق این برخود را با ما ندارید اما آن شخص به داد و فریاد خود ادامه داد که ما هم به شدت روبروی ایشان ایستادیم و از حق خود دفاع کردیم که در این هنگام تهدید شدیم که از اینجا بیرون نخواهیم رفت ؛ شما به ولایت فقیه ،رهبری، و مملکت توهین کردید؟؟؟!!! پس از تماس تلفنی دو مامور لباس شخصی به نزدیگ آرامگاه آمده خواستار این شدند که آقایان میلاددهقان،امیر رضا امیر بختیار ، آقای خلفی ، و بانوآریانا به دفتر حراست بیایند و به این ترتیب ما را با خود به دفتر حراست برده و به مدت 3 ساعت بازجویی کردند در این هنگام دیگر دوستان ما همراه با خانواده درون اتوبوس منتظر ما بودند. مسئول ارشد حفاظت که درون اتاق نشسته بود شخص محترم و متینی بود و در پی ارائه گزارش درگیری لفظی ما و ماموران به آن فرد لباس شخصی زیر دست خود که با مت برخورد کرده بود گفت ما با عقیده های شخصی این دوستان کاری نداریم. در مدت زمان بازجویی با یکی از ماموران لباس شخصی که رفتا محترمانه ای داشت گفتگو کرده و دلیل این رفتار آنان را جویا شدم و دریافتم آقایان از بهره برداری های سیاسی از این جریان می ترسند در صورتیکه حرکت ما و بودن ما در آنروز در آنجا به هیچ عنوان جنبه سیاسی نداشت و یک حرکت کاملا فرهنگی وایران دوستانه بوده چرا که اگر غیر از این بود به دنبال فراخوان یکی از کانال های ماهواره ای در روز 10 آبان در آنجا حاظر می شدیم. این نکته را به صراحت گفتیم که کار ما یک کار فرهنگی است و ما با خانواده صد ها کیلومتر آنطرف تر از خوزستان به عشق کوروش بزرگ در اینجا حاظر شده ایم اما خود آقایان با رفتار سیاسی شان باعث برداشت و بازتاب سیاسی گونه این رویدادها می شوند. پس از پرسش و پاسخ های طولانی فیلم دوبین هندی کم ما توقیف شد و تعدادی از عکس هایی که گرفته بودیم از سوی ماموران پاک شد. پس از آن گوشی های موبایل بررسی شدند تا خدای ناکرده از این رفتار آقایان و یا آن شعرخوانی فیلمی گرفته نشده باشد. یکی از دغدغه های ماموران حراست این بود که فیلم وعکسی از مراسم آنجا به بیرون و مشخصا به دست شبکه های ماهواره ای نیفتاده و مورد بهره برداری سیاسی قرار نگیرد.به هر روی مشخصات ما به طور دقیق و چندین بار در برگه های کاغذی و کامپیوتر آنجا یادداشت شد و مانند همیشه از چند زاویه مورد عکس برداری قرار گرفتیم . گفتن کلمه شیرو خورشید چه ایرادی داشت که آن فرد را این چنین بر آشفته کرد؟متاسفانه افرادی که در انجا به عنوان مامور گمارده شده اند اندکی از رفتار درست و مدیریت بحران در این موارد آگاهی ندارند و به محض برخورد با چنین شرایطی زود دست و پای خود را گم می کنند و تلاش می کنند با زور و تهدید و فحاشی شرایط را آرام کنند که دقیقا تاثیر معکوس دارد. چند نفر جوان میهن پرست که از استان دیگر به آنجا آمده اند چه خطری ممکن است داشته باشند که دوستان اطلاعاتی ما این اندازه هراسان می شوند. اگر بر فرض مثال فیلم و عکسی هم از گردهمایی های آنجا پخش شود باید مایه مباهات و افتخارهمگان باشد که این چنین میراث فرهنگی ایران از سوی فرزندانش گرامی داشته می شود. اگر آن مامور هتاک به ما اجازه داده بود شعر خوانده شود هیچ موردی اتفاق نمی افتاد و ما را هم از نوشتن این گزارش معاف می نمود. اما چرا باید از طبیعی ترین حقوق مان که خواندن شعر و سرود و ادای احترام و بزرگداشت در کنار آرامگاه کوروش بزرگ است محروم بمانیم؟ چرا باید به دوستان بختیاری برای پوشیدن لباس محلی بختیاری که نمادی از فرهنگ ایرانی است ایراد گرفت و از انها خواست که آنرا عوض کنند و در کجای قوانین ما چنین چیزی وجود دارد. چرا باید از نواختن ساز و دهل که سازهای محلی ایرانی هستند وبرای توریست ها بسیار جذاب خواهد بود جلوگیری شود. چرا در روزهای دیگر این موارد اتفاق نمی افتد و درست در روز کوروش بزرگ باید با این حرکت های غیر فرهنگی روبرو شویم و این خود دستاویز عده ای قرار گیرد که منتظر گرفتن ماهی از آب گل آلود هستند؟ چرا باید من، دوستان ما ، و خانواده های همراه باید بخاطر نگرش و عقیده خود مورد توهین و ناسزا قرار گیرند؟ بی شک فراخوان شهرام همایون در کانال یک در این برخوردها و احتمال زیاد بر خورد های روز جمعه 10 آبان بی تاثیر نبوده و نخواهد بود و من به عنوان یک ایرانی از استفاده ابزاری و سیاسی از نام و جایگاه کوروش بزرگ گله بسیار دارم و این مورد باعث شد برخلاف روزهای دیگر در آنجا به ما و دیگر ایران دوستان ساعاتی بسیار سخت بگذرد. پیامدهای این گونه حرکت های بی مورد و اشتباه از سوی اپوزیسیون خارج نشین و بی خبر از همه از جا، ما را هم بی بهره نگذاشت. اما به هر دلیل و با هر بهانه ای شرم آور است که در روز صدور فرمان حقوق بشر در کنار آرامگاه کوروش هخامنشی نخستین پیام آور حقوق بشر به فرزندانش جفا شود و حقوق شان زیرپا گذاشته شود. در همه این مدت به پاسارگاد و آرامگاه سنگی کوروش که میان داربست های فلزی حبس شده بود نگاه می کردم که چگونه غریبانه در اینجا رها شده است و به این می اندیشیدم که کوروش بزرگ در باره این روزگار چه می گوید و در این روز بزرگ جهانی که مایه سربلندی ایران و ایرانی است به جای شادمانی از حضور ما در کنار خود و اینکه هزاران سال پس از درگذشتش، مردم میهنش به یاد او و در کنار او هستند باید فرزندانش را که کیلومتر ها راه را به عشق دیدار مزارش سپری کرده اند اینگونه دل آزرده بدرقه سازد. کوروش ببین که من و تو در مام میهن چگونه غریب اوفتاده ایم...! 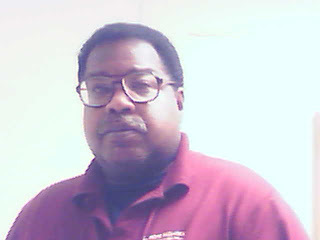 A view of the world through the keen eyes of a practiced observer. Politics government, society, sports, science or any other activity worthy of commentary. Now that I�ve given some background and history on Iraq. It�s time to take a look at Iran. When Iraq and Iran are placed against each culturally and historically, they are as different as night and day even though they are neighboring countries. Speculation about the future of these two countries I�ll leave up to you.